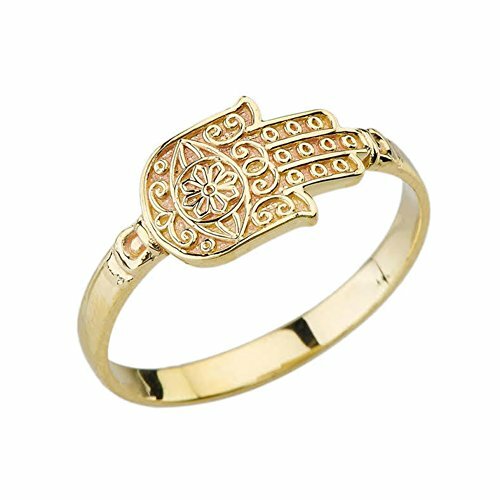 Elegant in its simplicity, the Hamsa Hand in this 10k yellow gold ring features a centered evil eye sun with an exquisite designs. It has become one of the defining symbols of Judaism and It is combined with the Hamsa Hand. The Hamsa Hand is an ancient Middle Eastern amulet symbolizing the Hand of God. In all faiths, it is a protective sign. It brings its owner happiness, luck, health, and good fortune. Individually hand polished to a lasting high sheen polish finish with it's sleek modern look! The Hamsa Hand has been the symbolic image in Islam and Judaism for centuries. It is known to always be associated with a female enttity offering protection from evil and misfortune with this traditional good luck ring. comes with free special gift packaging perfect for Anniversary, Birthday, Valentines day, or any occasions for wife, mom, girlfriends, sisters, etc. or for one's self. If you have any questions about this product by Middle Eastern Jewelry, contact us by completing and submitting the form below. If you are looking for a specif part number, please include it with your message.